"The last decade in Arts-Based Educational Research has seen the blurring of scholarship and artistry in innovative, generative, and provocative ways. This text demonstrates multiple forms of border crossings between disciplines, theories, methodologies, aesthetics, and ethics, which challenge traditional and positivist empiricism about knowledge making. What is specifically exciting about this text is that it focuses on those who engage with the materiality, rawness, and visceral quality of art-making without separating it from the enterprise of knowledge construction, as if those two things could ever be mutually exclusive. The editors have painstakingly put together a body of work that is comprehensive, inclusive and diverse. The scholartistry is groundbreaking and moves the field of Arts-Based and Arts-Based Educational Research into the next decade. This text should not be limited to those "alternate" methodological courses. Instead, this should be a foundational text that instructors could use with students who are new to qualitative research, social foundation, cultural studies, or educational anthropology to give them permission to think in creative, generative, and expansive ways without stifling them in restrictive boundaries. The attention invested in braiding the contributors’ work while being mindful about discourses in quality of arts-based work is simply breathtaking and exemplary." "This is an excellent resource introducing us to arts-based researchers and their work. I used the first edition in a course I taught on arts-based research, and it provided insightful understanding and stimulated significant discussions. My students loved it. I loved it. I felt like I was getting to know new, and some old, friends. It is a welcomed addition to help increase our understandings and appreciations of arts-based research and the people who do this work." 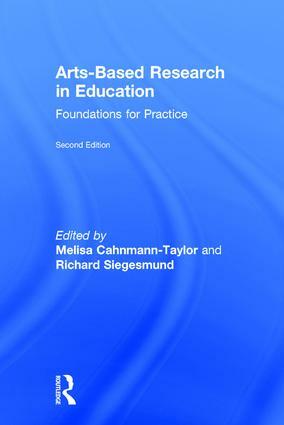 "Arts-based Research in Education provides scholars with an exploration of arts-based inquiry, including the theoretical underpinnings, challenges and opportunities, as realized through research exemplar chapters. Readers interested in post-structural and post-modern approaches to research, in exploring the messiness, ambiguity and meaning making qualities of education through arts-based research will love this book!" 7. What is an Artist-Teacher When Teaching Second Languages? 8. Ethnographic Activist Middle Grades Fiction: Reflections on Researching and Writing "Dear Mrs. Naidu"
10. "Songwriting as Ethnographic Practice", or "How Stories Humanize"
Melisa Cahnmann-Taylor is Professor of TESOL and World Language Education at the University of Georgia, USA. Richard Siegesmund is Professor of Art+Design Education at Northern Illinois University, USA.